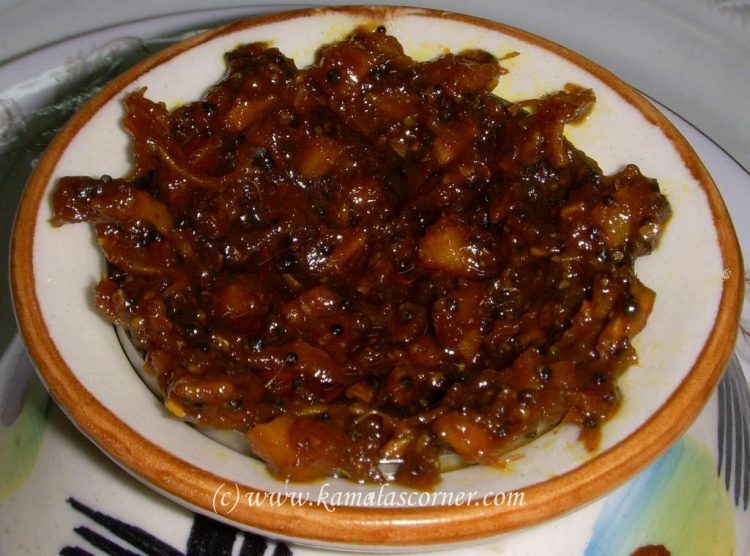 Inji Puli, also known as Puli Inji is a Kerala special pickle. It is normally prepared with ginger, green / red chillies, tamarind, jaggery and coconut oil. I have tried this pickle with gingelly oil and without green chillies. Wash the ginger and scrap the skin. Chop it into fine pieces until you have about two tablespoons. Soak tamarind in a cup of warm water and squeeze out the juice. In a frying pan add the oil and then mustard. When the mustard pops up, add chopped ginger and fry till its raw smell disappears and changes to slight brown. Add tamarind extract and stir well. Allow the contents to boil for a few minutes. Reduce the oven heat and add red chilli powder, turmeric powder, asafoetida powder and salt. Stir well and allow to boil. Then add jaggery and allow to cook on medium flame till it becomes semi solid. Finally add fenugreek powder and remove from the owen.